The tutors provide valuable support while offering you an insight into the industry and will aid you even after graduating. "I liked the city and the campus, as well as the opportunities to join a wide range of sports clubs and societies. I also liked the fact that I could do Costume Design and Making without having to choose a specialism immediately." "The course is very flexible; I requested a tutu making project and we got one. There is the opportunity to access lots of resources, including knowledgeable tutors, which enables you to cover so many different areas of costume." "The course has included several lecturers from industry. We had a lecture from Jane Cowood, who along with her business partner, Marjorie Rodgers, made all of Margot Fonteyn's tutus and costumes for Rudolph Nureyev. She has made costumes for many major ballet companies worldwide and gave us lots of detailed information regarding making costumes for the ballet as well as useful sewing tips." Why would you recommend this course to someone looking to study in this area? "The opportunity to build upon both making and designing skills is important, particularly if you change your mind on your chosen specialism. In final year you can choose a 70%, 30% or 50% weighting of either specialism. "Although I have always been a keen maker, this course has enabled me to gain confidence in my design work and improve in areas and ways that I would have not considered, and potentially regretted, had I not chosen this course. "The tutors provide valuable support while offering you an insight into the industry and will aid you even after graduating." Can you tell us about some of the placements you've completed during the course? "My first placement was with Mary Charlton where I worked on the 39 Steps touring production. I attended fittings and dress rehearsals in London and helped with the making, altering and repairing of garments for the production. "My work placements have all helped me to build contacts within the industry as well as giving me the opportunity to learn new skills and different methods of production. 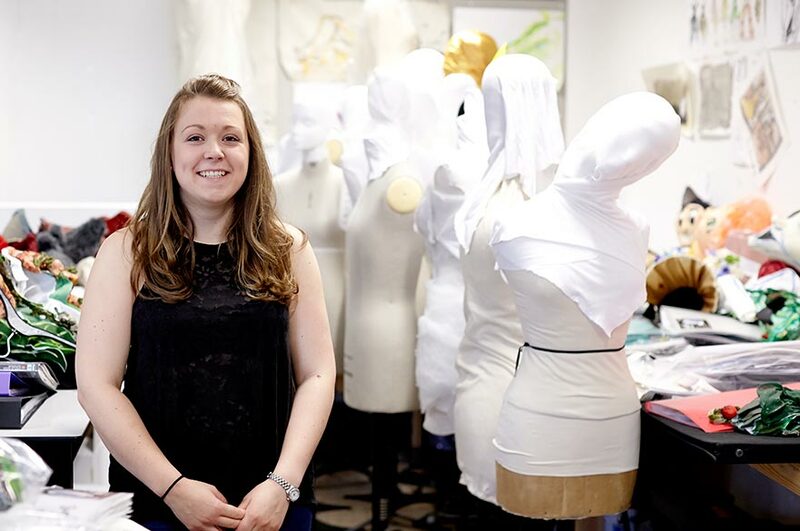 They have enabled me to see the full process of costume, from the initial fitting through to the final production." What advice would you give to someone thinking of studying this course? "Approach this course with a willingness to learn everything. Get involved with everything and you will get so much from it. Build up contacts and use the people around you to inspire and develop your own work."